I spent a lot of time on this recipe a while back but never published it on my blog. It was luscious, gorgeous, and very easy, so why didn’t it make the cut? Because I couldn’t figure out a way to do an accurate nutrition count. I decided to post it anyway and see if anyone out there could come up with a solution (other than actually paying to have the final dish analyzed, which would probably cost hundreds of dollars). If you read the recipe, you will see the problem: how to determine how much of the flour actually winds up in the gnudi. Weighing the ingredients and the final product doesn’t work because there is no way to tell how much the water content changes. I also tried several flour alternatives, thinking that it would at least be lower in carbs than the original, but nothing worked quite like real semolina. 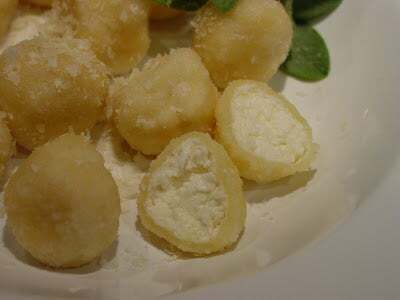 Gnudi means “naked” in Italian (they are also called malfatti which means “badly made,” because of their irregular shape). These tender little ricotta dumplings are like ravioli that make their own pasta wrappers. Even an authentic Italian gnudi would have less starch than ravioli, because the pasta covering is a perfect fit with no edges or corners. Perhaps two or three could be served as an appetizer even if a meal-sized portion turns out to be too high in carbs. Place ricotta in a strainer over a bowl and drain for 1 hour. Put the ricotta, salt, and cream in a bowl and mix until smooth. It should be moist but firm; add more cream if needed. It should hold its shape when rolled into a ball. Spread 3 cups of the semolina evenly on a sheet pan. Place the remaining 1 cup of semolina in an even layer in an 8- x 4-inch container with a lid or use a loaf pan and plastic wrap. Using a measuring spoon, scoop out 1-teaspoon-sized portions of the cheese mixture and place on a sheet pan. Roll gently until lightly coated. Roll between your hands to shape into round balls. Place balls in the container, making sure that they do not touch. Pour the semolina left on the sheet pan over the balls to cover. Seal the container and refrigerate for 48 hours. Remove the gnudi from the container and place on another pan. Refrigerate, uncovered, for one or two more days. Bring a pot of salted water to a simmer. 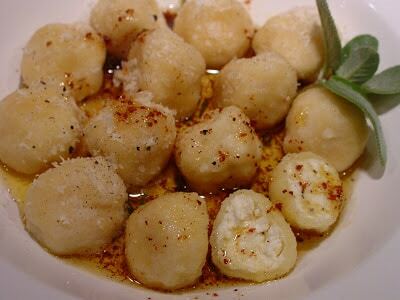 Cook the gnudi for 2 to 3 minutes, or just until warm in the middle. Lift out with a slotted spoon and drain on paper towel-lined plate. (Cook one as a test; wait another day if it disintegrates in the water.) Top with grated Parmesan and serve with Browned Butter Sauce, or use any pasta sauce. Semolina is a coarse-grained, yellow-colored, wheat flour. You may find it in the bulk bins so you can buy only as much as you need. All pasta is low glycemic because it is made with hard wheat. This recipe is based on one developed by Scott Staples of Restaurant Zoë in Seattle. If I’m understanding the problem with the nutrition calculation, the reason you can’t just weigh the leftover semolina and subtract its weight from the original weight of all the semolina (in order to determine how much semolina stuck to the cheese) is that the leftover semolina has some water in it. In other words, if you just subtracted, you would underestimate the amount of semolina that stuck to the cheese. Would it be possible to dry out the leftover semolina in the oven before you weigh it? Thanks for the suggestion Susanj. I’ll try drying out the semolina first to be sure it has little or no water content and then drying what’s left afterwards to determine the difference. I think I’ll need to make a larger batch, so it is easier to measure. I knew someone would help me out! I used to make a lower carb ricotta gnocchi, but it was always a struggle to keep them from disintegrating. Maybe with some of the newer low carb flour options, I might figure it out. SiouxziQzi, it's been a while since I did these and I don't remember what flours I tried. We didn't have all the gluten-free choices then that we have now, so it might be worth trying again. Semolina, however, is very low glycemic, so pasta is a bit better than bread as the carbs are slower.